Layers of Fear is an intriguing experimental haunted house, but without a proper sense of pacing, it fails to scare. Creative blocks can feel truly maddening. To have an idea that exists in an ephemeral space just beyond reach is like having your face pressed to the windows of a sweets emporium after closing. The choice: carry on or throw a brick through the glass. In Layers of Fear, you play as a formerly renowned and unnamed painter whose critical success starts to fade after a series of domestic tragedies. You take on his perspective as he attempts to complete his magnum opus while his mind quickly unravels. It’s a videogame take on the mad artists’ Royal Dissolution of Reality, but I expected more subtlety in a terror so psychologically driven. 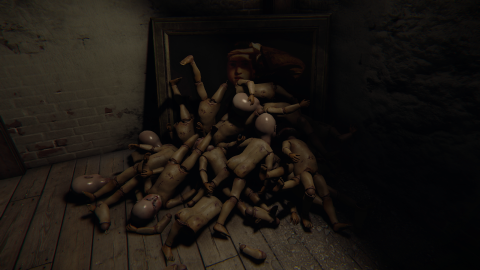 Layers of Fear skirted right by the potential of its premise and hit me over the head with dozens of spooky baby dolls. It’s a creative, excessive haunted house without almost no sense of tension framed by a curious, but unsurprising narrative. Layers of Fear is at its best in the opening minutes. A mansion foyer resolves from blackness, and I’m looking through the eyes of the artist. With my crippled leg, I hobble from room to room, opening drawers, reading the occasional note or newspaper clipping, familiarizing myself with the space and its former occupants (see: Gone Home). But before I can emotionally attach myself to the home or its early history, I’m thrown right into Act II, where I mindlessly traverse a series of hallways that turn in on themselves and lead to illogical rooms with locked doors until—Boo! the next jump scare completes. Nonlinear storytelling can be very effective with the proper context, I just found it hard to be horrified before I knew what was at stake. There are still plenty of letters, notes, and clippings to find that fill in the events leading up to the mad artist’s collapse. But there’s less incentive to explore every mind-hallway cupboard and closet without a sense or orientation or permanence, especially because mind-drawer #027 only houses a drawing of a winged demon rat for narrative convenience. Found-object and epistolary storytelling feel arbitrary unless they can speak to the specific space they’re in or objects they directly relate to. Gone Home’s Christmas Goose clued me into an entire family’s traditions and sense of humor. A winged rat demon drawing tells me something I already know: the mad artist is, well, mad. The rest of the game rests too heavily on tired horror tropes—baby doll imagery for instance. When they first appear, it feels like homage, a small jumpscare nod to an institutional staple. Boo! Check it out, I’m a scary-looking doll! But then the baby dolls keep coming. A wailing baby cry hangs out for a while. I explore a few more rooms, turn around and, guess what? That empty wall? Full of cracked porcelain baby dolls. There’s twenty minutes of the stuff. One cuts me off in a long hallway in a dead on sprint only to slam their head on a dresser. The incessant percussive string hits announcing the arrival of more baby dolls start lose their jumpscare PA power. A surreal ride on a miniature carousel leads to some floating doll heads. Another doll stands near a crib and repeatedly smacks their head on the railing. I’m laughing now. Maybe this is one of those titular layers I’m peeling back. Even though Layers of Fear fails to scare, it’s a pretty short, breezy ride through the mad machinations of the player-protagonist’s mind. I filled in the necessary blanks to understand where the story was going early on, but curiosity kept me around in hopes of seeing the narrative follow through, maybe twist and turn along the way. It didn’t. And, if you can run it well enough, the environments and visual effects can look cool, at the expense of spooks and performance. When a still life painting of fruit starts spitting out apples, slowly first, then in massive waves to an orchestral crescendo, I'm not scared as much as intrigued by the physics and visual effect. Damn, look at those apples go. Similar horror gags make up the majority of the experience. Hallways twist and turn without adherence to logical space, environments change in your periphery, paintings melt and warp and laugh when you’re not looking; there’s a huge variety in how the game tries to scare, but it tries so often—literally almost every room—that even the most creative scares hit with the impact of a dime-sized Jason Voorhees. And even if the effects look nice, the framerate stutters without warning on a powerful PC. Nausea, another layer of fear? Yeah, I'm not quite sure what's going on here. Paintings tend to melt in Layers of Fear. Notes, letters, and the like drop creepy narrative hints. Put that kid in time out. A baby doll looking dour.